I used not to carry a flashgun with my SLR and the artificial light turned the whole scene green - so this picture of the DSB unit on the train ferry at Puttgarden on 18.5.01 had to turn monochrome! This wasn’t quite as ambitious as it sounds! The gradual northward spread of the red lines on my map was getting me to the point where the two passenger train ferries to Scandinavia were in sight. Accordingly a round trip was planned, out via the Puttgarden-Rødby ferry and back by the Trelleborg-Sassnitz one, completing the trip with some of the diminishing number of ex DR lines which I still needed. The customary early start for Düsseldorf, this time courtesy of my long suffering wife who took me to BHX for the 0715 flight. It was late this time but the breakfast was far better. [Oh, happy days.] Fortunately the BA checkin person was sympathetic and let the rucksack go, so at DUS I was able to make a sharp exit for the shuttle bus to D-Flughafen station. The inevitable ‘Merkins delayed the bus by about one minute so I missed RE11115, 1013 ex D-Flughafen, by about one minute, its ex-passengers just coming up from the platform as I arrived. In fairness to the ‘Merkins (why?) the bus is slow and circuitous, not a very satisfactory arrangement. The sooner the new danglebahn is operational, the better. Nevertheless, I made ICE 857 ‘Else Laske-Schüler, 1021 ex D-Flughafen’ OK and as this had been my best guess before leaving the UK, I’d reserved to Bielefeld. Nothing new from D-Flughafen to Bielefeld other than the ICE being 4 late despite a 10 minute booked stop at Hamm. Bielefeld seems quite a cheerful place, at least in the immediate neighbourhood of the station. A quick trawl of the nearby establishments turned up a tobacconist selling beer! The 1223 to Rotenburg (Wümme) was a 3 car set of the wretched Slim Jim double deckers. Having had to travel backwards from Düsseldorf it happened again, but only for a couple of stops. 232493 was noted at Porta Westfalica hauling two dead electrics on a train of Audis. Porta Westfalica presumably gets its name from being the point where road and river (and rail of course) pass through a gap in a long ridge [Wiehengebirge and Wesergebirge] running more or less E-W. There is no other high ground nearby and the whole thing must be some geological freak. A statue (of Kaiser Wilhelm I) presides over the whole thing, protected by a large and ornate stone canopy. Minden has an old stone station building of a castellated style known only to its architect! A very slow run once off the main line, until the Hannover - Bremen line is reached at Nienburg. Very boring too, it must be said. Somewhat quicker thereafter, even on the ‘branch’ from Verden to Rotenburg. The 1447 RE Rotenburg to Hamburg-Altona was about 5 late but regained some time, partly by carrying a very noisy group of women past their stop! 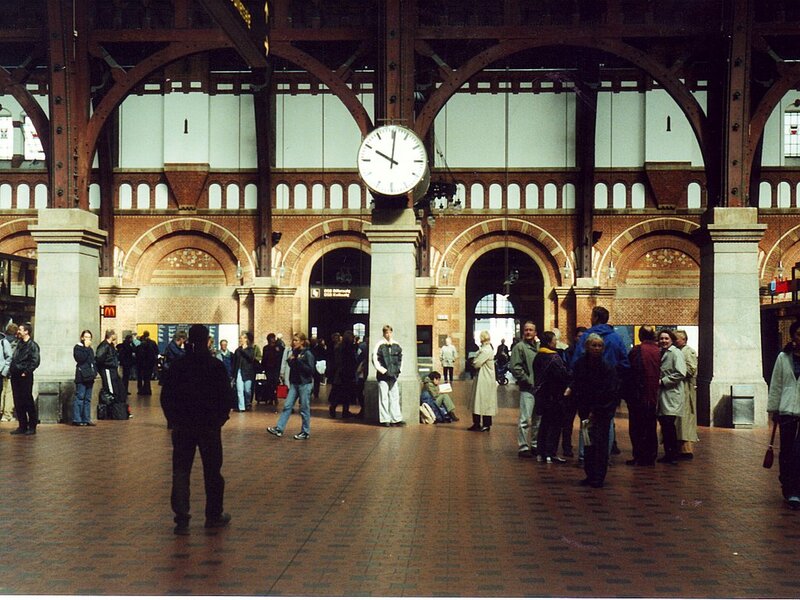 More or less on time at Hamburg-Harburg where a snap decision was made to lengthen the connection at Lüneburg by taking 1639 IR. Serves me right - it was wedged and I had to stand. Lüneburg looked OK but there was insufficient time to prove it before 1633 to Lübeck, the first 628 of the trip. Pleasant exit from Lüneburg but then serious cornflake country. At least the sun has returned, temporarily I suspect. Brief excitement crossing the Elbe at Lauenberg, then cornflakes on to Büchen where the Lübeck trains have their own platforms on the ‘branch’. A bit more interesting after Büchen with a lake at Mölln which presumably connects with the Elbe-Lübeck canal as it had a large trip boat on it. DB obliged me by being dead on time, eliminating any worry about the 24 minute connection at Lübeck. To have planned (say) Manchester Airport - Lincoln - Dover with a 24 minute connection on to a P&O ferry… no, all right, it wouldn’t be sensible. 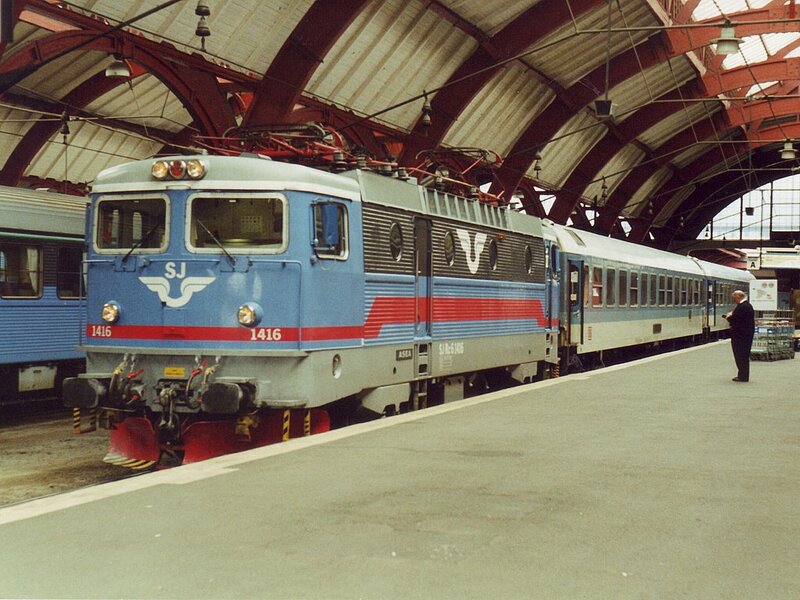 When ‘Karen Blixen’ appeared at 1805 she turned out to be a very comfortable (and full) 4 car Danish IC3 DMU. Quite a pleasant run into Puttgarden with a bridge connecting the island of Fehmarn to the mainland. Large yards at Puttgarden, seemingly disused., the only sign of life being a pair of Rabbits with the stock of the next southbound IC. Transit on to the ferry (Scanlines ‘Prins Richard’ of Rødby Havn) was straightforward though we waited three or four minutes at the platform end, presumably for some of the lorries which share the train deck. Can’t really see the point of passenger train ferries but it’s great fun though possibly the oddest motion of a train you could ask for (it rolls gently, seemingly independent of the ship but presumably just behind it). The whole thing is fuss free and you can wander back and forth to the train and car decks when you want [cue fit of the vapours from H&S if we tried it]. Pro rata, the shops and restaurants are bigger than P&O and co as well, and cheaper, so no manic queueing. Very satisfactory and far removed from the usual constipated British attitude. Very efficient unloading at Rødby Faerge which had equally grandiose and disused facilities. There was also a rabbit (furry, not 2000 hp diesel). The Danhotel is clearly visible from the station and appears easily walkable. [I’d thought about staying there, can’t remember now why I didn’t.] Interesting to note the order of the Danish conductor’s announcements; Danish, English, German. His German counterpart had done the more predictable German, Danish, English. Another long and very dull ride to Copenhagen enlivened only by a couple of crossings between islands and a few more diesel locos than I had expected (electrification is only from Ringsted onwards). København Hovedbanegård is pretty scrappy at platform level but does have a very fine concourse albeit with the usual quota of very dubious persons, especially at 2200. The Ibis proved to be just around the corner, and thoroughly unsatisfactory, being in the throes of a major refurbishment. The Triton is one of three bought recently by Accor which is the only possible excuse. Local bars seemed to be all gay/strip clubs/whatever, so I was pleased when it started raining and gave me an excuse to scuttle back to the hotel beer-less. 1016 to Malmø Central was a smart new electric, comfortable and smooth riding. I never did discover what the ‘H’ in København H is - even the station signs show it. [It’s Hovedbanegård]. The Øresund link is suitably impressive; tunnel for the first part, then a really serious double deck bridge (road over rail). And, of course, no fuss. First travel survey of the trip came round at Kastrup Airport station (labelled ‘Copenhagen Airport Kastrup’). ‘Scenery’ on the Swedish side is exceptionally bleak and depressing. Being charitable, perhaps an overcast morning isn’t helping. It’s a grim ride to Malmø where some very heavy duty shipbuilders’ irons are in evidence. Having an hour to spare, I had a stroll round the town centre, which looked very pleasant in the newly arrived sun with a goodly number of hotels. Tourist office (9-5 in summer, I imagine not Sunday) is at the station. Swedish Railways (Malmø) works band was entertaining a small crowd in the station concourse. Brass/woodwind/percussion, anything they lacked in musical ability was balanced by smartness of royal blue gold braided jacket… The same could not be said of the dancers. Song sheets were handed out and unbelievably the congregation did condescend to sing (some of it anyway). It sounded like a Swedish ‘Down at the Old Bull and Bush’ but it could have been the national anthem for all I know. Trainwise, a couple of X2000 sets were in evidence. Quite smart, a sort of down market TGV. Approaching the train ferry at Trelleborg, 19.5.01. Note the complex pointwork for the ferry's 5 tracks. IR317 proved to be two DBAG IR coaches, a neat little SJ Bo-Bo electric and very few passengers (one of whom, inevitably, asked me about seat numbers and unlike everyone else since Rødby Faerge yesterday, didn’t speak English). On the way out, noted a rake of CD and ZSR coaches - presumably via Swinoujscie though didn’t see any PKP ones. Extensive freight at Trelleborg – and quite wrong about the CD/ZSR coaches, it’s a Praha- Malmø service. Today’s was standing in the platform at Trelleborg, a far less godforsaken spot than Puttgarden or Rødby Faerge. Shunting at Trelleborg was very snappy, with wagons on first followed by DB coaches, freeing up the SJ loco to take the Czech train on to Malmø. Not much action after the arrival of a 628 at Lauterbach Mole on 19.5.01. Note the third rail for the narrow gauge trains. The ferry is a large beast with five tracks, all full. Same fuss free (except you’re not allowed back on the train deck), queue free arrangements and a nice meal of pork medallions, peas and boiled potatoes, washed down with Rostocker Pils, all for DM21 which seemed reasonable as compared with a pub. And compared with the price of a cross-Channel ferry. 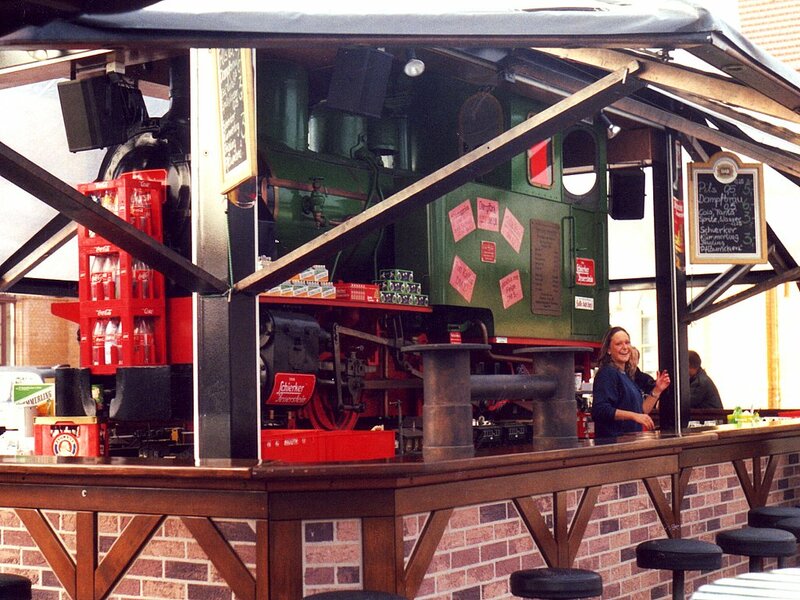 Shame about the Rostocker Pils, but there’s always a snag and the alternatives were Tuborg or Beck’s alkoholfrei. Quite a smooth passage across the Baltic (better than my last one, in a force 9 gale in a just unloaded 2,500 ton freighter in 1963). Rügen was well in sight by 1530 and the phone had hooked itself back up to D1-Telekom. Having left the K-Buch downstairs, timetable scheming is impossible but with the 1 minute connection at Bergen for Lauterbach unbooked and looking unlikely, I’ll probably have to stick to plan tonight. A long run in round the eastern end of Rügen and past Sassnitz, then the procedure at Mukran (the actual port, Sassnitz Hafen having closed for train ferries) is to turn outside the harbour wall and then enter the harbour stern first. This is pretty wimpish compared with the ‘tear in and spin round’ approach prevalent at Dover! The ferry was berthed by 1700 and five wagons with the passenger coaches behind, were hauled off first. This ensemble was dragged into the platform at Sassnitz Fährhafen/Mukran station and the wagons detached before an electric was put on the front. I’d love to see EWS and Railtrack deal with this. Away from Sassnitz Fährhafen on time at 1717, I kept my fingers crossed and was rewarded by making the 1 minute connection at Bergen. The doors closed behind me but the train stopped again after 50 metres to pick up an even later (and older) arrival than me! On a very pleasant sunny evening it’s a nice run down to Putbus and Lauterbach, enlivened by the sight of 01 1066 in steam in Bergen yard. The physical connection on to the narrow gauge at Putbus is separate track (DB and RüKb use opposite faces of a new island platform). The mixed gauge looks most odd with the 750mm only just over half of the ‘real’ line. It looks as if they work push-pull, or top and tail with their diesel as there is no loop at Lauterbach Mole, a picturesque spot with a brand new platform beside a small yacht marina. 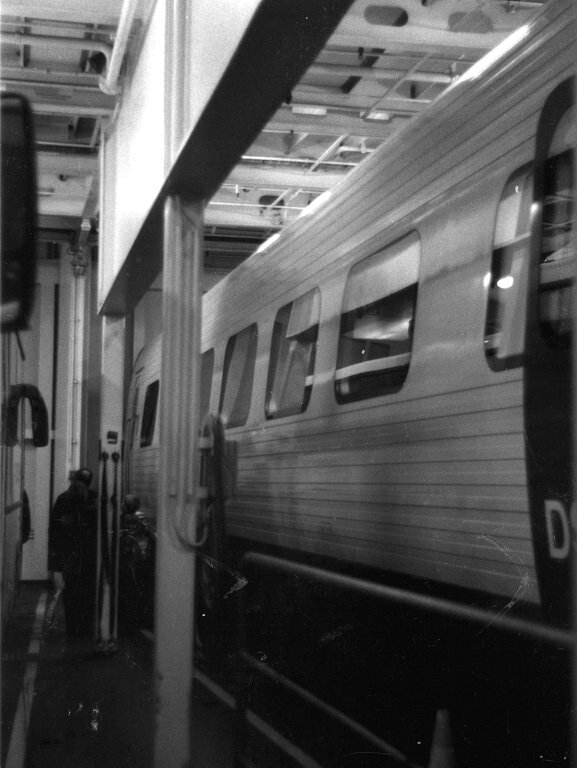 A rather grainy 01 1066 waiting to leave Bergen (Rügen) with a railtour on 19.5.01. Back to Bergen in good time for 1830 to Sassnitz - sufficient time to note that Bergen has had a major upgrade since I was there in September 1993. The station bar so thankfully sheltered in then is now brand new and very smart (and has moved I think) but shuts early (1700) and doesn’t open on Sundays. Pity, I wouldn’t have minded a Dortmunder Union for old times’ sake. On to Sassnitz in a Slim Jim double decker, noting the odd loop, separate alignment really, at Lietzow. Would be interesting to check what does P1 or P2 there. Passed a train of preserved stock on the way, heading back towards Bergen. The old Sassnitz Fährhafen branch is still in situ and wired, but very rusty. Obviously I’m not going to be going there! Sassnitz ‘proper’ is a little country-style station with a sort of conservatory on the front, containing a shop, inter alia. Buffer stops at the end of the platform but looks as if it might have gone further once, sidings for the harbour branch perhaps. The harbour branch is a Folkestone style one, though single line, requiring reversal coming from Stralsund, then a steep descent to the port. Back to Bergen again to find 01 1066 with 14 coaches in P1. Sadly 232596 was attached at the rear end and seemed to be assisting, albeit gently, when the Pacific left, spreading clag all over the landscape. Or similar. P3 has a fence on the inside, P1 (which my RB used) is in effect a bay. Returning on the 2029 RB to Stralsund, a Franziskaner purchased yesterday was opened to celebrate a thoroughly satisfactory grice. Memo: don’t do this again, canned Franziskaner is not nice! Did P3 at Lietzow for the fourth time. Binz was not in fact the last track of the day; I had forgotten the curve from Rügendamm towards Stralsund Hbf. Fortunately with arrival at 2129 there was still plenty of light. The InterCity was round the corner (not in the Altstadt like HRS would have you believe, but I’d already worked that out) and being only a year old, very spick and span. Too tired to bother staggering a mile or so to the Altstadt, I reviewed tomorrow’s arrangements and crawled into bed. Stralsund Hbf is immaculately rebuilt with a glazed area between booking hall and platforms. It seems to have been built as a terminus facing the Berlin and Rügen direction with the Rostock line added afterwards on quite a sharp curve. Last night’s train from Binz used a terminal platform; today’s plan requires a through journey from Züssow to Rostock, so hopefully it’s all being done to the most stringent standards! A gentle trundle on the (electric) RB to Barth and back first. Velgast has physical connections at both ends but from the rust it looks as if all Barth services use the one east of the station. The branch is a harmless enough rural wander, if flat and undramatic. It’s one of the ‘stop at the next field’ variety. Barth is quite run down, with no freight now, and it looks as if it may only have been electrified because everything else was. The line used to continue beyond Barth, so there may have been freight further on to justify the investment. The journey was enhanced by a bod almost too drunk to stand, and not appearing at all, er, well either. Nevertheless he was still trying to down more Rostocker Pils. Surprising that he could recognise a can, much less open it. This on the 0819 too. Back at Stralsund, disaster struck with 1019 not going through to Züssow as per Kursbuch. My own fault; I should have checked last night. Off to get stranded at Greifswald for an hour – no buses to anywhere on a Sunday morning so nothing for it but to wait for the 1140 to Züssow and RTFM next time! I still should get to Rostock 2 hours earlier than originally planned. Having eventually reached Züssow I found the Usedomer Bäderbahn much changed, with new track at least all the way to Zinnowitz (including most of the sidings at Wolgast) and new class 646 units instead of the 771/971s, many of which are stored at Zinnowitz. The large area of roadworks and general excavation next to Wolgast Hafen station is now neatly paved and the trains can charge happily across and over the new bridge. The old Wolgast Fähre station remains, apparently converted to private residential use; the new one is on the new alignment just short of the point where it joins the old one (or would have, were it not submerged beneath a new road bridge). On to Zinnowitz, failing to spot the pub at Trassenheide early enough to see if it was open (it was). In the event the train was a minute or two late at Zinnowitz due to the late running of the DB train at Züssow so there was only a 10 minute wait before another 646 turned up. Completely uneventful return to Stralsund; there’s a bar at Züssow but insufficient time to patronise it. At Stralsund I dumped the rucksack and went for a very quick look at the Altstadt. It’s getting there, but perhaps best left for a while. The usual (for these parts) intimidating brick cathedral. Of decent, open pubs were there none. Retrieving the bag I joined 1540 RB to Rostock for another gentle Sunday meander. It was, and remained, surprisingly wedged. A Rostocker Pils and Friday’s ‘Times’ passed the time; I’ll have to pay attention on the IR tomorrow. At Rostock (Hbf being rebuilt, complete chaos) a quick check on the yellow sheet was followed by a trip across the road to Hotel am Bahnhof to check in. Unchanged since previous times save for a bolt-on en-suite and a minibar, but perfectly acceptable (and breakfast at 6, bless ‘em). Back through the rubble to P9 for 1732 Rostock Seehafen Nord, the intended circuit being RSN - Warnemünde - R-Hbf – Tessin - R-Hbf. Hopefully this will give me a good enough start for a leisurely meal tomorrow night, but I won’t hold my breath. 143075 provided pushage past miles of yards, interspersed with large blocks of flats, to a godforsaken station seemingly in the middle of nowhere (don’t be fooled by the sunshine or the ‘Warnemünde’ on the display; that’s where it’s going next). After another trundle through the blocks of flats (including Lütten Klein, my first port of call in August ’92), Warnemünde was a revelation. I obviously should have read the Rough Guide properly. As well as a busy ferry port there’s a delightful fishing village with several streets of half timbered cottages and a thriving tourist trade, which at 1900 on a coldish Sunday evening was just closing down. You’d never believe it as the train calls at Warnemünde Werff (shipyard), the penultimate station. Back to Rostock Hbf for a quick refuelling stop before the final track of the day (really) on 2005 to Tessin, another 642. 15 late leaving, apparently waiting a connection, but that didn’t matter as arrival at Tessin was still well before 2100. Quite a nice run up to what passes for high ground hereabouts, but Tessin itself had nothing to offer round the station other than some rather grim flats. A large “retail park” provides (presumably) the raison d’être for Tessin West. Photos duly dealt with, it was back to Rostock to prepare for tomorrow’s 0600 breakfast! Which was perfectly adequate, with coffee dispensed by a fairly scary waitress. Chatty receptionist though, who spoke good English and charged me DM10 less than I was expecting, rightly or wrongly. A perfectly satisfactory establishment for its price, whichever it was. Away at 0635 having allowed time to check out which wasn’t needed in the event, so 0704 to Wismar was no problem. This was another of the smart and uncomfortable 642s. 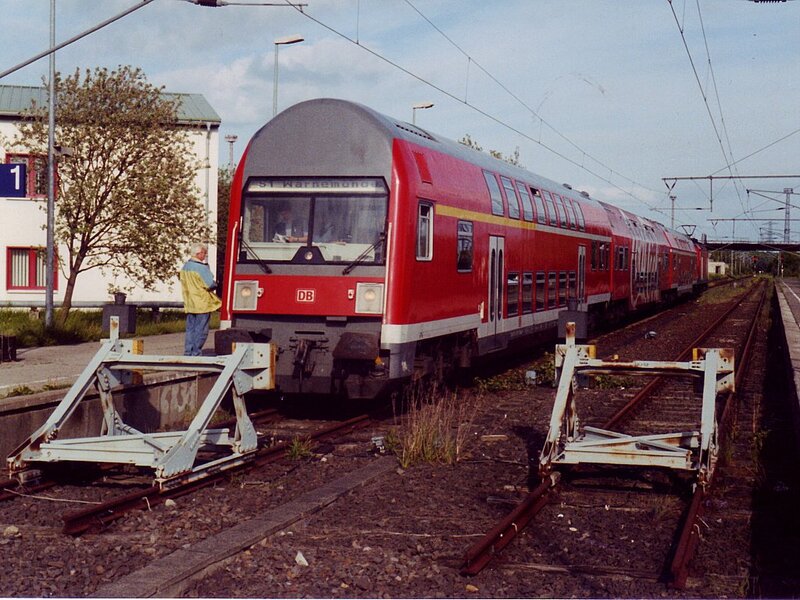 A 219 with a 2-car double deck set was in evidence at Rostock Hbf and having temporarily forgotten the Rostock - Wismar line diagram in last night’s 642 I was disappointed when the kart turned up. 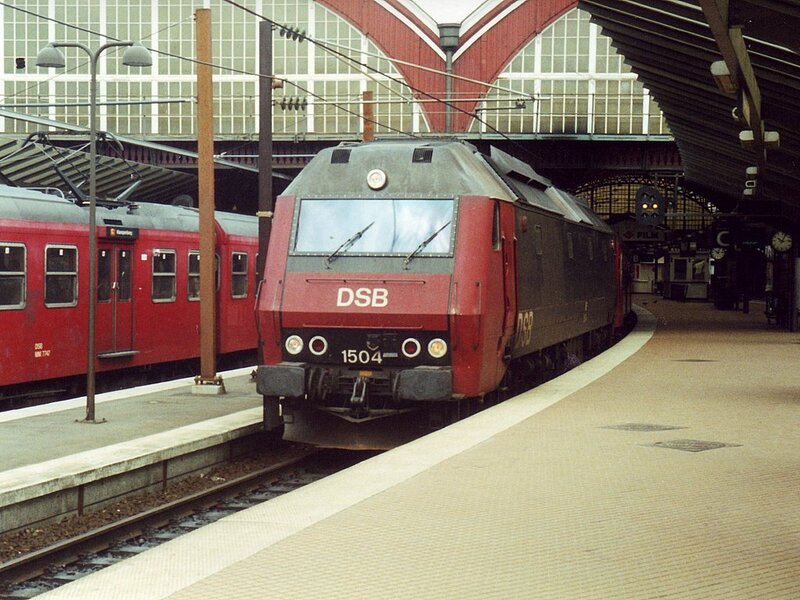 This Rurtalbahn Regiosprinter was well away from its usual haunts at Duisburg Ruhrort, 22.5.01. The line used to continue behind me to the Rhein train ferry. It’s a nice run to Wismar through (very) gently rolling countryside. Bad Doberan, where a lot of the full complement of passengers disembarked, has been done up and looks very smart. One of the 2-10-2Ts was being coaled, nothing else visible. The loop on the standard gauge starts half way along the single platform so the units stop at opposite ends before the Rostock-bound one moves into the loop. The line appears to have been completely rebuilt during its recent closure, with quite a number of platforms being moved or altered. At Wismar there are 3 platforms, P1 the shortest. All three are accessible from the Schwerin line, only 2 and 3 from Rostock. 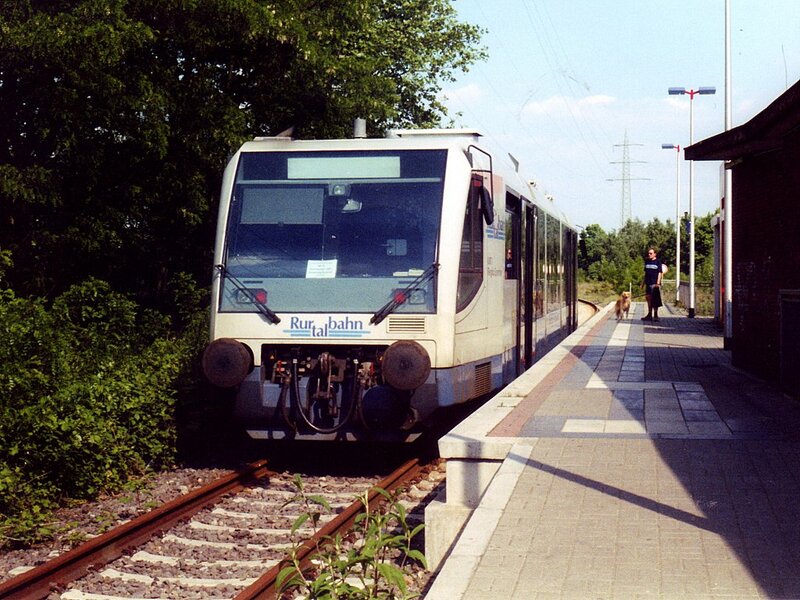 Most Rostock trains use 2, most Schwerins 1, with IRs to Schwerin using 2. Unfortunately an IR was being shunted when we arrived so the kart went into 3 (and the 0832 SE to Wittenberge left from 1). Still, as both are in effect just parallel alternatives to 2, I’ll try not to lose sleep! Freight lines pass on both sides so you go through a subway to reach the street, and a very run down one it is too. Couldn’t really tell in such a short time but there was nothing immediately to suggest that Wismar is thriving. Impressive brick cathedral though, complete with flying buttresses. 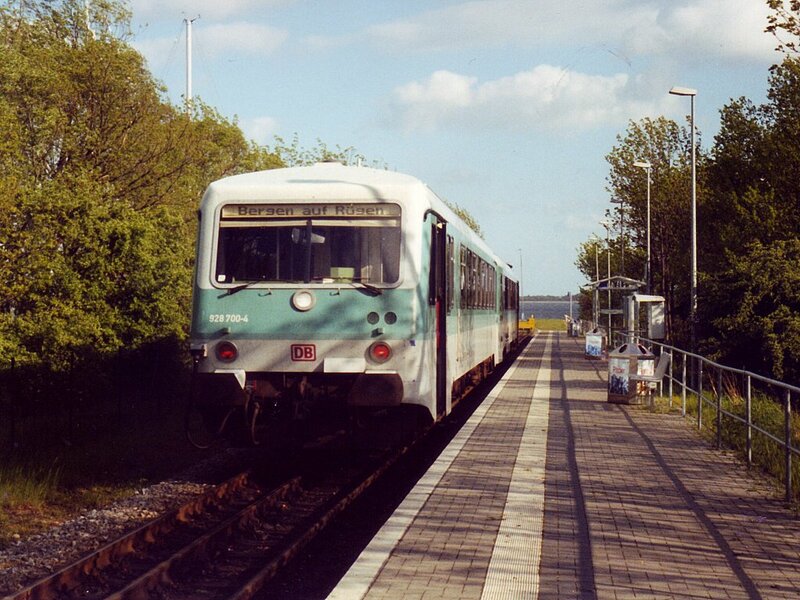 A short semi suburban trip to Bad Kleinen where the physical connection is well east of the station and just to make sure, the Wismar train arrived at P2 (next to southernmost) and the Binz IR left from the same one. The IR is surprisingly full though I suspect many will decamp at Rostock. Bad Kleinen is almost devoid of passenger facilities and not somewhere you would want to spend unnecessary time (like this afternoon for instance). Dreadful snails pace run to Bützow but arrived there on time having left Bad Kleinen late, so it must be allowed for in the timings. On time at Rostock. I managed to pay attention at Rovershagen this time – a very rusty track disappearing to the left into the undergrowth is presumably the Graal-Müritz branch. I think we can safely write that one off. [Not one of my most prophetic remarks. I was very pleased to do the reopened G-M branch in February 2006!] Huge traffic queue was noted on the Rostock-Stralsund main road; it doesn’t look as if much has changed since August 1992. 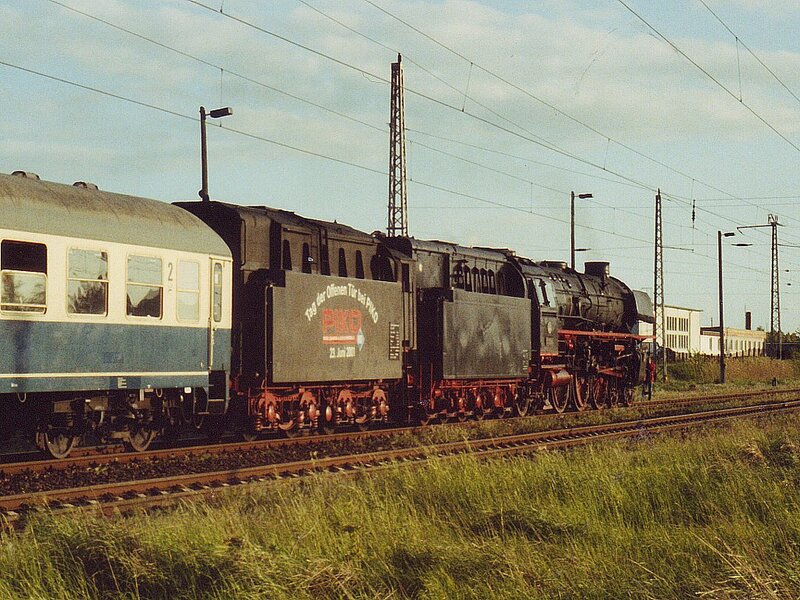 Restoratives were purchased at Stralsund, then on to the 1120 RE (express? They’re kidding) to Neustrelitz. This is the sort of train that makes gricing more duty than pleasure. Having served my sentence of 2 hours, plus a bit, including a 12 minute stop at Neubrandenburg extended to 14 by the summoning of the polizei for reasons unknown, refreshment was clearly in order at Neustrelitz. The station is being comprehensively rebuilt (and I do mean comprehensively), the Gastätte-Südbahnhof and the kiosk outside the station didn’t look too exciting so I ventured up to the town. I was rewarded with Zur Sonne, a reasonable enough pub in the corner of the main square. I missed it last time, but I’m not sure it opens in the evening. Either way, a Königs Pilsener, served by the landlord who resembled a certain well known politician [also strongly resembled by the operator of the station buffet at Donauwörth some years later], went down very well. En route I had passed one caff advertising Berliner Kindl (‘nuff said), and one advertising Herforder Pils whose (male) patrons were all drinking coffee or soft drinks. I wonder why. Back at the station, 1424 IR to Rostock turned up on time and well filled, though not enough to preclude a decent seat. On time throughout, and another gap filled (from Waren(Müritz) to Lalendorf on the Güstrow - Pasewalk line). At Rostock there was the most miserable DB cove you could want not to meet [was he transferred from Koblenz I wonder]. He must have been taken on in DR days after being chucked out of the Stasi as unsuitable for a customer facing role. Despite him, and a dimwitted young lady more helpful but equally uninformative, I eventually found out that the OME kart to Güstrow via Laage was on P9 and 10 minutes late. [How things do change. In February 2006 I was back at Rostock ReiseZentrum and the young lady at the counter was seriously bright, absolutely helpful and right on the ball. Couldn’t fault her. And in fairness that’s usually true of RZ staff. Only the very occasional bad apple in 14 years so far.] With a 12 minute connection at Güstrow this was a bit disconcerting but as it was on to another OME kart it seemed highly likely to be held, and even if not it wouldn’t be a disaster. In the event a minute or two was regained and the other kart was a minute or two late, so it was all easy peasy. A surprisingly pleasant ride too, as long as you looked out of the window and tried to ignore the excruciating seats. On to Bützow where the kart failed (I think - at least the conductor chucked everybody off and advised me to go to Bad Kleinen on the train alongside). We all piled on to a Kiel-bound, Rabbit-powered RE which stormed along to Bad Kleinen but not quickly enough to make a –6 minute connection. We stood on the platform like spare parts, wondering what to do next, when the OME kart, miraculously restored to health, appeared only a couple of minutes late. It must have done a banzai run from Bützow because the recorded voice was still at least two stations behind which greatly confused at least one passenger. No bones broken, and it made Schwerin by about 1820. Off to the InterCity to be greeted like an old friend, then to the travel centre where no English (them) and no German (me) still managed to reserve a seat on the Hamburg - Münster IC for tomorrow. En route to the Güten Quelle, discovered that neither the no 4 tram nor the no 7 bus (which turns into a 71 and goes somewhere else) runs to Wüstmark late enough to connect with the infamous 2143. Therefore resolved, after a very nice pork steak and less nice Lübzer pils, to go mad, get the 2104 to Schwerin Süd and walk back to Wüstmark. Seemed like a wizard wheeze until I got off the train at Schwerin Süd and discovered that I’d got off the last train (other than a bustitution at 0020 or something). Also the train had gone what seemed like 10 miles past the junction [with the Parchim line. In reality it’s only about 1.6km/1 mile] before stopping… Nothing for it but to press on so I strode out through the industrial estate and somewhat footsore, made it with 7 minutes to spare. The train duly turned up, on time and in daylight and with a grandstand view through the open cab door, so the thing was well and truly done. A cloudless evening too, and you could see a couple of miles at least - in fact there was still daylight back at Schwerin Hbf. I retired for a celebratory Schultheiss, well satisfied. There was incidentally no sign of any reason for the daytime closure which allegedly finishes with the new timetable (OME (?) trains running Parchim-Rehna). Still, I didn’t want to come back just for that so with everything else in the north east cleared except tomorrow’s Bad Kleinen - Lübeck it was well worthwhile. Highly satisfactory breakfast at the InterCity. Major administrative difficulty at the checkout (no excuse, Mr Steigenberger Hotels, for not training your receptionists properly) resulting in an 0738 departure for the 0739 to Bad Kleinen. [This wasn’t the first time I’d had problems at this particular hotel, either, so I think my ‘no excuse’ comment at the time was a fair one.] Made it, somehow. OME kart to Bad Kleinen (P1 for a change, have now done PP1, 2, 3 and 4!) and out again from P3, as used by last night’s Rabbit, behind Rabbit 218327 to Lübeck. This was a great run on a sunny morning with the countryside in full ‘spring greens’. Cows lying in the sun - all very bucolic. The Archers comes to Mecklenburg. Back to reality at Lübeck where two Rabbits were top-and-tailing 0904 to Lübeck-Travemünde Strand. 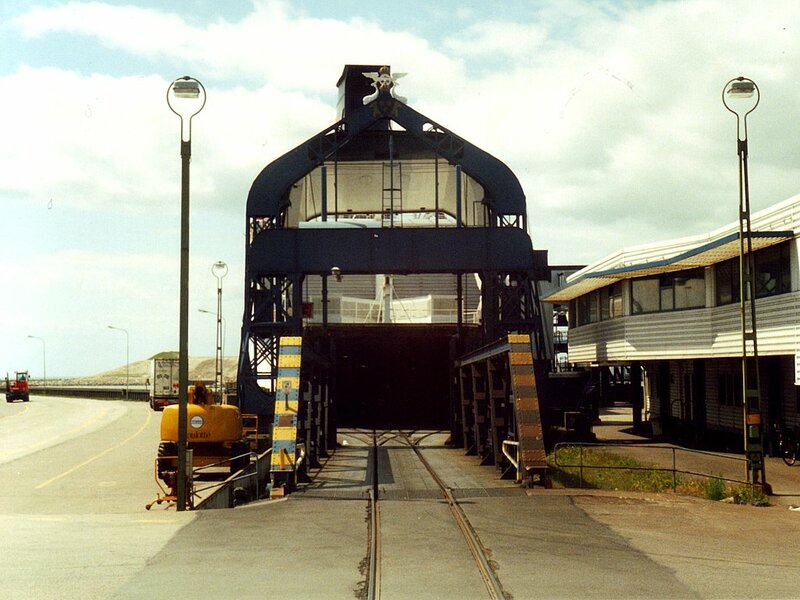 This is a fairly short branch in the Felixstowe style with port, then Strand station at the end. Unlike Felixstowe the catchily named Lübeck-Travemünde-Skandinavienkai’ has the Scandinavian ferries on one side of the line and rolling fields of barley on the other. Strand station is a glum looking place seen from the platform but with a 3 minute late arrival on a 6 minute turnround I didn’t have time to look outside. It might be a rococo fantasy… This particular train had worked through from Hamburg but terminated at Lübeck on the return. The 10 minutes late departure of 1004 to RE (another Rabbit, ex Kiel) underlined the wisdom of not cutting it too fine on the way back to the airport. Memo: remember this foolish remark later! At Hamburg there was still nearly an hour so a brief walk was taken into the unprepossessing shopping centre, and on return a Holsten Pils as fortification. When the IC arrived (late, but not very) it was absolutely wedged and the seat reservation was well worthwhile. Two hours of dull stuff then, apart from the fairly short stretch from Rotenburg (Wümme) to Bremen Hbf which is entered from the west after a half circle round from the north. The IC was on time here and a few minutes early at Münster where RE12020 was waiting to go to Recklinghausen. Yet again the police were in evidence and when they left, so did the IC (late again), whether by coincidence or not I don’t know. After a half hour wait at Recklinghausen Hbf it was on to the S-Bahn from P4. This diverges from the main line before Recklinghausen Süd so changing at Hbf was a Good Move. Did the curve to Herne satisfactorily; I hadn’t considered the junction here but luckily it’s west of the station. Another half hour to wait for a DB train to Oberhausen, so a cheese roll at Kemp’s and a Schlösser’s Alt in ‘Charlie’s Bummeling’ [I suspect this means a place to dawdle] which had a vaguely railway theme with lots of kettle pictures and one or two other bits. Next was 1619 to Gelsenkirchen and Oberhausen (eventually Aachen), a less than scenic route. To say the elast. At Oberhausen a DKB unit was waiting as 1652 to Duisburg-Ruhrort which would have been a real surprise had it not been reported in TR! It’s an interesting if ugly branch with one or two quite rural single track bits among the industry. At the end of the branch it obviously continued (across a tram line) but there is no sign of the former train ferry operation visible from the platform. Returning to Oberhausen I stepped on to 1727 RE to Koblenz - stepped off it again at Duisburg intending a quick shop but in the end 1744 IC to Stuttgart looked the only guaranteed safe bet for the airport so I dived on to that and endured the lengthy bus ride from D-Flughafen to Terminal C. This is really a poor option and future plans may well revert to the S-Bahn, pending next year’s introduction of the Danglebahn. Back at the airport numerous people had turned up late and were jumping the queue. While highly irritating, perhaps it could happen to me one day, so temper best kept (and was - there wasn’t a rush and Finnair checked me in eventually!). [This was an uncannily prophetic remark, unlike the one about Graal-Müritz. Guess what happened on my next trip…] As there was still time to spare I took the opportunity to buy a Schiphol - Emmerich ticket (DM28) for next week. Back to BHX more or less on time (dry chicken and lettuce roll but a nice G&T) and thence to Telford as planned, thanks to a late running VXC. I'd already planned to go back later in the month, combining some comparatively cheap spare days on my Eurodomino with a comparatively cheap flight to Amsterdam, so 10 days later I was off to Amsterdam en route to some more German branches.